In its mission to become a more complete partner for its campuses, Barnes & Noble College has built an impressive suite of tools to support students, faculty, and administrators. Barnes & Noble College offers the largest textbook rental program in the industry and recently launched affordable and advanced Courseware using open education resources (OER). At the same time, Barnes & Noble College bookstore outreach, in areas as diverse as career preparedness and emotional well-being, has established the bookstore as a lynchpin for driving student success both in and out of the classroom. But it’s perhaps in the whole area of technology that the company is beginning to make important strides with teaching, learning and assessment tools that are designed to significantly help schools combat some of their biggest challenges. “We’re getting a lot of positive feedback about the new digital services we are offering,” says Barnes & Noble Education’s Chief Digital Officer, Jay Chakrapani. “Our campus partners appreciate the way we’re supporting them with products that take aim at significant challenges in higher education. At the same time students tell us, over and over again, that they want more interactive, engaging learning opportunities,” he adds. 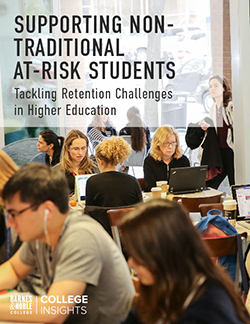 Through its own research findings, Barnes & Noble College has also found that students and faculty are looking for more affordable course materials that could be leveraged through OER. Barnes & Noble Education Courseware delivers on that trend by providing a solution that offers affordable, highly customizable OER courseware with a robust analytics component that addresses student retention and can improve learning outcomes. As desirable as all of these goals might seem, Chakrapani recognizes there are obstacles. 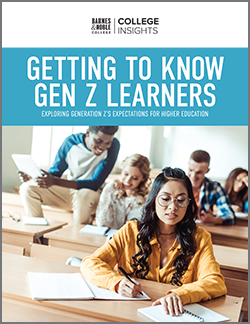 Barnes & Noble College’s research, through its College Insights platform, indicates that while 69 percent of faculty predict their use of OER materials will increase, less than 5 percent are using OER today. The adoption of OER in the classroom can still seem intimidating. A print companion, produced for focused reading, was found to be useful for 83 percent of the students polled. The pilot research also showed that students had positive engagement with the multiple types of content (text, audio, videos, etc.) and that self-checks helped to drive positive learning outcomes as students could progress through the content and receive feedback along their learning path. Had trouble with Enlight at first, but now works pretty smoothly. Just have to know the process. Glad to hear, Cheryl. FacultyEnlight is designed to make faculty’s lives easier, saving time and helping them choose the most cost-effective course materials for their students. Thanks for your great comment!